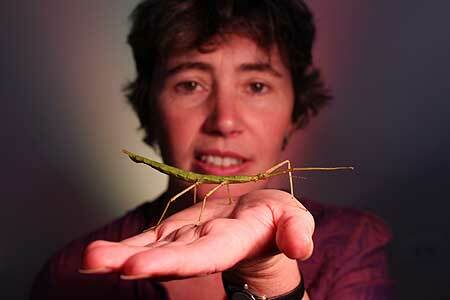 Dr Mary Morgan-Richards with a female stick insect. Male stick insects are becoming increasingly redundant, with new research showing some New Zealand female stick insects can reproduce as efficiently on their own as with a male mate. Not only that, the females capable of reproducing without male help always produce female offspring. The research, by Dr Mary Morgan-Richards of the Ecology Group, describes the distribution and evolutionary relationships of sexual and asexual populations of the stick insect. The work was a collaboration with Dr Steve Trewick, also of the Ecology Group, and Dr Ian Stringer, from the Department of Conservation in Wellington. The findings featured in a paper entitled Geographic parthenogenesis and the common tea-tree stick insect of New Zealand, published in the international journal Molecular Ecology. The team conducted several experiments involving the reproduction of the species. Some populations have equal numbers of males and females that reproduce sexually, but others have unmated females that lay eggs that hatch and produce offspring identical to the mother, a process known as parthenogenesis. The team took females out of sexual populations and raised them on their own. Despite the lack of a male to mate with, the stick insects that usually reproduced sexually were capable of reproducing asexually. “All of the parthenogenic populations of stick insect are to the south in New Zealand compared to the sexual populations more to the north,” Dr Morgan-Richards says. They do not have a clear idea of why that is but it seems to fit with the idea of range expansion — organisms moving to warmer places further north when the climate cools and expanding their population mid-range by going south when the climate warms. The researchers found similar hatching success in mated and unmated females. Mated females produce equal numbers of male and female offspring, with most hatching within 9-16 weeks. In contrast, most of the offspring of unmated females were female, and the eggs took 21-23 weeks to hatch. The difference in the development rate of the eggs “may have to do with the mechanism that they use to grow without sperm — but we don’t know", Dr Morgan-Richards says. She suggests that competition between the two sexual forms could be influenced by an extended development rate in the south. The next phase of the research will try to determine the cause of such low rates of sexual reproduction from formerly parthenogenic populations.